A massive £571.67 was raised at the recent School Association 'Can't Cook, Won't Cook' event that saw teachers go head-to-head with pupils in a Pampered Chef themed cook off. School Association Chairman Mr Jim Harrison would like to thank everyone who either contributed to or supported this successful event. Plans are already underway for a 'Fun Olympics and Barbeque Evening' in June. Year 11 pupils welcomed Lisa Hall a 'Global Education Facilitator' to speak to them about issues regarding conflict in today's world and got them thinking about ways in which they can be overcome. The issue of 'Conflict/Resolution' is part of their Learning for Life and Work Local, Global and Citizenship GCSE Module. All Year 12 pupils took part in a Study Skills seminar today that was delivered by Ben Best from Tree of Knowledge. This session aimed to start pupils thinking about preparations for the forthcoming GCSE examinations by offering advice on study techniques - a very informative and useful seminar. Some of our Year 10, Duke of Edinburgh, pupils took part in a fundraising event at The Outlet Shopping Village in Banbridge on Saturday 24th March. Here they were able to take part in Rock Climbing, Laser Clay Pigeon Shooting, Archery as well as handing a number of birds of prey. It was an enjoyable day for all involved; including Mr Chambers! Teachers have become concerned in recent weeks about the increasing number of pupils bringing high energy drinks such as BPM, Red Bull and Boost into school. Publications from the Department of Education (DE), the Department of Health, Social Services and Public Safety (DHSSPS) and the Health Promotion Agency for Northern Ireland (HPA) identify such drinks as contributors to obesity, dental decay and lapses in concentration. The latter obviously has an impact on the teaching and learning within classrooms. To this end, it is requested that parents would not give any of these high energy drinks to children. Healthier options such as bottled water or Fruice fruit drinks (apple and orange) are available for sale, if required, within school. Please feel free to contact me if you wish to discuss this matter further. School Association Members should note that the next meeting will be held on Tuesday 27 March at 7.30pm. An agenda and relevant documents for this meeting have been emailed or posted to all Association Members. 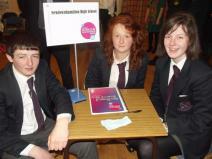 Year 10 pupils travelled to St Patrick’s High School Keady on 16th March 2012 to represent Newtownhamilton High in the Key Stage 3 Science Quiz. With 12 schools (grammar and non-grammar) from the area participating, it was a difficult challenge. Our team performed well and were in 3rd place about the ½ way stage but were kept out of the prize winners during some of the later rounds. Well done to Matthew, Caroline and Elizabeth. 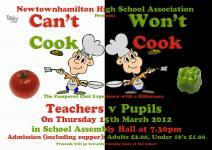 Newtownhamilton High School Association held a highly successful 'Can't Cook, Won't Cook' event on Thursday 15 March 2012. This Pampered Chef themed event saw teachers (Mr D Sloan, Miss L Graham, Miss V Hadden & Mr A Chambers) go head-to-head with the pupils (Jennifer King, Chloe Johnston, Alan Cooke & Derek Preston) in a cook-off with the audience deciding the overall winner by either voting green pepper or red tomato. Pampered Chef Consultant Mrs Beth McNiece guided the fierce competitors through their recipes but her advice obviously wasn't enough for the teachers as the pupils emerged victorious through the 'unbiased' voting system. An impressive supper (which included the end products of the cook-off) was provided while the audience got the opportunity to purchase Pampered Chef products. Association Chairman Mr Jim Harrison closed the evening by thanking everyone involved in the organisation of Can't Cook, Won't Cook and also thanked all those individuals that provided food and financial donations. Local pharmacist Adam Bartholomew, from Cullyhanna Northern Pharmacy, challenged Year 12 on the negative aspects of smoking and presented strategies to overcome and kick the habit. All pupils were given a leaflet and encouraged to share it with their family and friends. Pupils took the opportunity to ask Adam questions regarding a career in pharmacy. 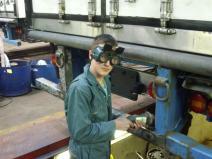 Furthermore his advice on A-level choices and work experience was relevant to the pupils. The Under 14 football team won 3-0 away to Drumglass High School in their Mid-Ulster league fixture on Tuesday 13 March. Year 9 Pupil Jim Preston (pictured right) proved to be the match winner on the day with 2 strikes while Daryl Johnston scored the third. Well done to Mr Black and his successful team! Our Year 11 pupils have been spending this week on work experience as part of the school CEIAG (Careers Education, Information, Advice & Guidance) programme. Mr Mullan, Mr Megaw and Mr Black have been clocking up the miles as they travelled around the country (with a camera) to visit pupils at their work. More photographs can be found on the gallery page or by clicking here. Finally, a big thank you must go to all the employers who made this programme possible. Year 10 pupils made to their way to Parliament Buildings Stormont on Wednesday 7 March as part of the LLW Local & Global Citizenship programme. Prior to the visit, pupils had been learning about democracy in different countries and so this trip gave the opportunity of bringing it all together. After a tour of the building, the pupils got to sit in the chamber and have debates on various issues. A fantastic experience for the pupils! 08/03/12 - It's Official: Newtownhamilton High School is the Tops! Teachers in Newtownhamilton High School were delighted to see the publication of recent statistics (Belfast Telegraph paper copy 05/03/12) in the form of a league table, this time for the percentage of Year 12 pupils achieving their 5A*-C GCSE grades including the all important GCSE English and Maths. Under this measure and using the Department of Education's own figures, Newtownhamilton High scored 61.1%. Not only did this put the school as the top controlled non-grammar school in the area, Newtownhamilton High is the top controlled non-grammar school in Northern Ireland. Indeed, Newtownhamilton High is the ONLY controlled non-grammar school in the top 10! Principal Garnet Mullan commented, "Obviously our school is built on much more than academic success, because we care so much about the individual pupils, their needs and aspirations. Nevertheless it is very gratifying for Newtownhamilton High School to receive this accolade". "All credit goes to the hard working teachers aided by support staff, who receive backing from the parents in the community. These figures prove what I have been saying for a number of years - that the Quality of Education offered in Newtownhamilton High is second to none. We know that this message has been delivered to the corridors of power in the Department of Education". 05/03/12 - World Book Day Celebrated! On Thursay 1st March 2012, Newtownhamilton High School English Department joined in the nationwide World Book Day festivities! Yr 10 pupils went online, viewed and discussed film trailers for popular books. Many of the books are presently in our Library and others have generated great interest so our Librarian intends to try and stock them. As part of the celebrations the English Department is now running the World Book Day ‘Design A Bookmark Competition’, for further details see Mrs Robinson or check out the Literacy Noticeboard. On Friday 2nd March 2012, Year 8 pupils travelled to Cortamlet Primary School to hear famous author, Colin Bateman, speak. He recounted how he became an author, read from ‘Running with the Reservoir Pups’ and took questions from pupils. This was a very interesting experience. Copies of the novel: ‘Running with the Reservoir Pups’, are now available in the Library. Pictured above are the Year 8 pupils with Author Colin Bateman at Cortamlet PS. At Newtownhamilton High School we are always looking for ways in which we can do things better and to this end we recently asked parents for their views and opinions on the school through the completion of an on-line Google survey via this website. A report on this survey can be accessed by clicking here. The Year 9 Newtownhamilton High/St. Paul's High (Bessbrook) rugby team achieved an impressive 10-10 draw with Aughnacloy College (Year 10 team) yesterday. The joint team, which has been established as a result of the Sharing Education Partnership (SEP) programme that exists between the two school, is hoping to build on this encouraging performance when they face further games in the near future. Meanwhile, despite an encouraging performance, the Year 10 netball team lost out 14-6 to Aughnacloy College. Our School Association will be hosting a ‘Can’t Cook, Won’t Cook’ event that will take place in the school assembly hall on Thursday 15 March 2012 at 7.30pm. This Pampered Chef experience is certainly different as teachers go head-to-head with pupils in a cook off, with the audience deciding the overall winner by either voting green pepper or red tomato. Like all functions organised by our School Association, we hope that this event will reinforce the excellent links that already exist between the school and the wider community while raising much needed funds in the current economic climate. Admission to the event will be £2.00 per adult and £1.00 for under 16’s (payable at the door) with supper included. In addition, up to 15% of money spent on Pampered Chef products will be added to the profits.